A contemporary take on the G-Shock heritage, this men's model is fully metal made. From the ion-plated bracelet, to the case and bezel. A digital display set upon a black dial with radio-controlled timekeeping and a bluetooth smartlink. This watch boasts water resistancy up to 200 metres. Created in celebration of G-Shock's 35th anniversary, collaborating with the planet's "Most Successful Virtual Act", Gorillaz. Casio G-Shock Full Metal Men's Ion Plated Bracelet Watch is rated 5.0 out of 5 by 2. Rated 5 out of 5 by Anonymous from 60th Birthday Gift My family bought me this brilliant stylish watch for my 60th Birthday. 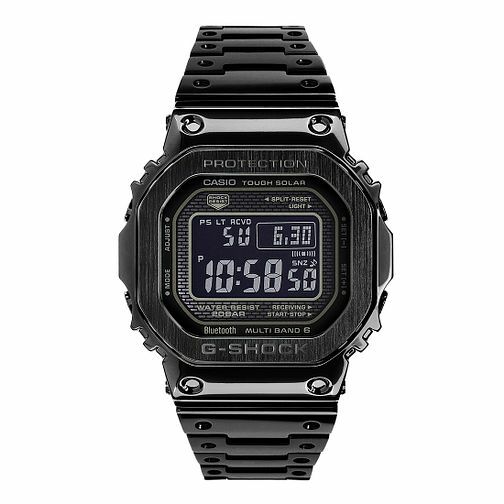 I wanted quality, accuracy, rugged, waterproof, easy to use and a special G shock watch. It’s stunning but understated, shines and makes me very happy but does not attract unwanted attention that other blingy watches do. One feels the quality and loves wearing it every day. When I check the time / date I remember the loved ones that bought me this quality collectible timepiece.